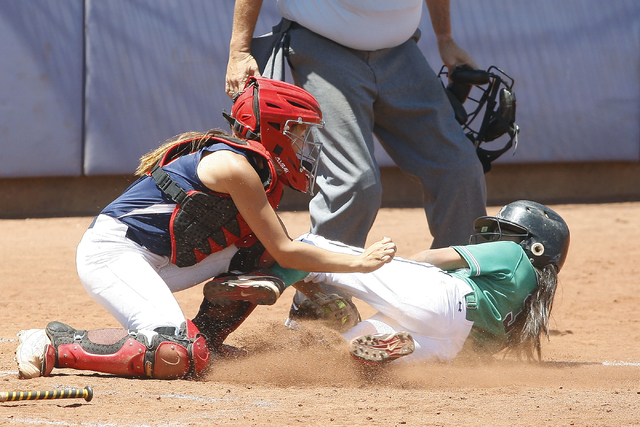 All season long, Centennial softball coach Mike Livreri has stressed how important playing defense is to his team’s success. In the Class 4A state tournament at Majestic Park on Friday, the Bulldogs showed they were paying attention. The Bulldogs played flawless defense, handling 64 chances without an error, as they advanced to today’s championship game by defeating Foothill and then Shadow Ridge by 7-1 scores. In the winners’ bracket final against Northwest League rival Shadow Ridge (27-11), Centennial’s gloves and arms were simply sparkling. Mikayla Djordjevic’s running backhanded catch of a liner down the line in left saved at least one run in the first inning. Paige Reese sprinted from left-center to right-center to haul in a drive in the third, and the Bulldogs turned a pair of double plays. “Coach told us at the start of the year we needed to play defense, we needed to back our pitchers up,” said Lee, who went 3-for-4 with a double, two runs and an RBI. Meanwhile, the Bulldogs (29-9), who scored once in the first, took advantage of two Mustangs errors in the fourth inning to score five unearned runs and build a 6-0 lead. Reese capped the inning with a three-run single. That was more than enough for Centennial pitcher Jennifer Watkins, who spun a four-hitter and allowed only one runner to advance past second. Reed-Shadow Ridge winner must beat Centennial twice to capture the crown. Reed and Shadow Ridge meet at 10 a.m. In the opener against Foothill, Juelaine Noa smacked a three-run home run with two outs in the fourth inning, and Centennial tacked on two runs in both the fifth and seventh innings. Lindsay Konopelko allowed only one hit — a fifth-inning homer to Rhiana Balaun — and struck out three. Reese went 3-for-3 and scored two runs, and Lee was 2-for-3 for the Bulldogs. Foothill pitcher Shelbie Medrano struck out 16, including Centennial’s first six batters. Shadow Ridge 2, Reed 1 — In the other first-round game, Shadow Ridge’s Mandy Harmon had a no-hitter until Chelsea Cohen’s two-out solo home run in the seventh. Mary Jordan had an RBI single in the second inning and Casey Velarde an RBI single in the fourth to support Harmon, who struck out five. Reed 2, Foothill 1 — Brooke Silva’s one-out double in the bottom of the eighth inning plated Tia Wunder with the winning run as the Raiders eliminated the Falcons (28-13). Rosie Ritchie scored from second on a throwing error in the fourth inning to give Foothill a 1-0 lead, but Reed responded with a run in the fifth. Medrano again struck out 16 for the Falcons and had the team’s lone hit — a seventh-inning single.